Liverpool captain Steven Gerrard does not expect to get a fond farewell from Everton's supporters when he plays in his final league Merseyside derby. Gerrard, 34, has been a target for Everton fans for many years and thinks there will be little change at Goodison Park on Saturday (17:30 GMT). He said: "I doubt it very much. I love the banter with Everton fans. It's what it's all about. It's about rivalries. "I don't mind it at all. Bring it on, as far as I'm concerned." 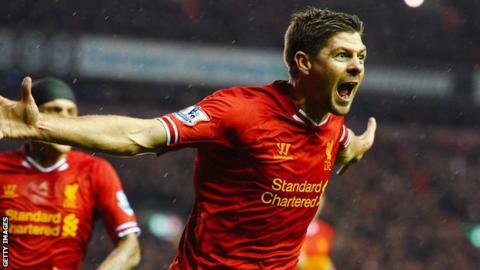 Gerrard will end his Liverpool career at the end of the season before a move to MLS side LA Galaxy. Although this will be his final Premier League appearance against Everton, he could still face Roberto Martinez's side in the Europa League with both Merseyside teams having the first leg of their last-32 ties on 19 February. Only Ian Rush has scored more goals for Liverpool in the Merseyside derby than Gerrard, who has netted 10 times in 32 appearances against Everton - including the Reds' goal in a 1-1 draw at Anfield in September. And he hopes to sign off on a high by extending Liverpool's unbeaten nine-match run in the fixture. Gerrard added on Liverpool FC TV: "It will be my last derby and it will be someone else's turn to be in the spotlight. "I love playing against Everton. I've got friends and family members who are big Blues and it's all about the bragging rights in the city. "It's a bit different from a normal league game, but I'm looking forward to that one and hopefully I can add to my good derby record." Everton manager Martinez hopes the spotlight will be on his team rather than Gerrard, as they look to build on last Saturday's 1-0 win at Crystal Palace - their first victory in nine games. Martinez said: "When we play the Merseyside derby at Goodison, we want it to be our Merseyside derby and that's the only thing we are looking at. "As a football club, we have been in a period when we haven't been enjoying the results that we wanted, so we will look forward to it being our Merseyside derby." How much will the top players earn this weekend? Read more on How much will the top players earn this weekend?